Isrāiliyyāt undoubtedly is one of the most debated concepts of modern studies in Qur’anic Exegesis. This concept has attracted more attention than it had in the past. It has occupied a central place, which has generally been a negative one, in many debates. The studies written on the subject could not keep themselves distanced from the defensive mentality and biases developed during the process of Muslims scholars’ meeting with the West. The Isrāilī narrations existing in the books of Qur’anic exegesis since the early days have been regarded as foreign materials dangerously infiltrated in Islam from other cultures during this process. This approach towards Isrāiliyyāt, as in the case of all defensive approaches and biases, has prevented the healthy evaluation of Isrāilī materials. 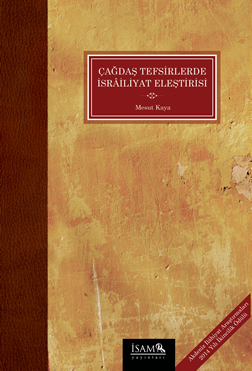 In this book, various issues such as historical process of Isrāiliyyāt both terminologically and contextually in Islamic literature, the biases against Isrāiliyyāt in modern age and their influence on shaping the perception of Isrāiliyyāt, criticisms towards Isrāiliyyāt and the factors bringing about those criticisms, and whether or not those criticisms are consistent, are dealt with. It also analyzes the phenomena of narrating from the Jewish and Christian books as often encountered in contemporary books of Qur’anic Exegesis, its reasons, and its methodological problems.